I'm popping over to the Playground today with this bicycle - definitely not riding it though which would be too difficult!! A large snippet of music paper was chosen as a background; penny farthing was stamped onto a snippet of card before cutting out with a circle die and a sentiment with two smaller circle snippets. What really started me on making this card was the embossed snippet with the gears which I thought would be good for a male card and the rest just 'grew' from this which was just lying around unused. Di has used an interesting die (no pun intended) to make her card for inspiration this time and of course that, with some sentiment stamps, is the prize on offer for one lucky person. 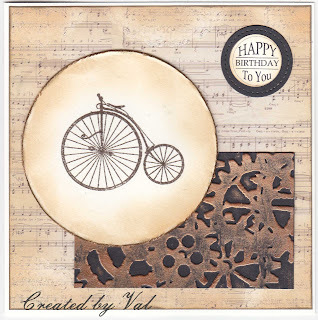 A fabulous snippets card Val, I love the penny farthing and the musical background that you've given it too. I love how your card was built around that great embossed panel! WOW, I love this card with that old-fashioned bicycle! what a very super snippets creation. your design is brilliantly created. Love the wonderul cogs and the Penny Farthing bicycle. Totally love this card Val - so clever how you built it around the cogs starting piece as well! Sorry I'm a bit late commenting. Great card for a guy! Wonderfully designed!